Can you guess a place where you can buy a plot of land from a serene environment within the Colombo city at a cheaper price and imagine buying a four square feet plot at Rs. 18,500 inclusive of Value Added Tax from Borella? Yes, there is a place you can buy a small plot of land at a cheaper value in Colombo. But to avail yourself of the deal you need to adhere to certain conditions. First, you have to be among the dead and secondly the plot of land you are going to buy can be utilised only for you to rest in peace at your death. Thirdly, you are supposed to buy only four square feet as the increasing population in the Colombo city has restricted the lands allocated for the dead to lay their remains in peace. Borella cemetery, which is the most sought after place for burials and cremations in the country, has become a cometary for over 500,000 who had died from its inception in October 28, 1866, with the burial of 55-year-old English lady. That was the reason for the authorities, the Public Health Department of the Colombo Municipal Council, to restrict the square feet allocated for tombs constructed within the Borella cemetery. The heavily congested cemetery with hundreds of thousands of graves, gives an idea why the authorities have to restrict the number of square feet allocated for vaults and tombs of the dead. But, when John William Abriel became the first recipient of a deed for a grave plot, he could own a plot of 16 square feet (8'X2') by paying a sum of Rs. 30. But it was on April 22, 1872 John William owned that grave plot. In the 19th century Rs. 30 would have been an huge money considering the value of the rupee those days. But today, Rs. 18,500 might be a meagre amount compared to the rupee value today and the land value in the city. According to Chanaka K. Perera, the Cemetery Keeper of the Borella cemetery, around 6,000 to 8,000 grave plots of 4' X 6' have been allocated as family graves till the 1960's and the allocation of family grave plots have been stopped since then. "Even in the Roman Catholic, Church of England and the Christian sections owned and maintained by respective churches, over 20,000 grave plots have been allocated as family graves", he added. The Borella cemetery has a Roman Catholic Section, Church of England, the Christian Section, the Buddhist, Hindu and general sections. The general section is allocated for those who do not own a grave plot and also burials in case of deaths occurred in the same family within a short span of time. Those family grave plots have been used by generations and now those grave plots are being used by the third generation of the original owners. The number of the names engraved in the tombs indicate the number of people buried in the same grave which has become their family property. Ownership of a grave has also become a valuable investment as we can see some advertisements in the classified sections of Sunday papers or in websites to sell these grave plots. They value the plots sometimes at Rs. 300,000 for a 4' X 9' grave plot. Therefore, the value of these grave plots is ever increasing as the demand for burials in the Borella cemetery is very high. But, due to the death of the owners, some grave plots, are not been utilised by the family members as they are not aware of the ownership and due to owners leaving the country leaving no trace of the ownership of these grave plots for the members of their families. 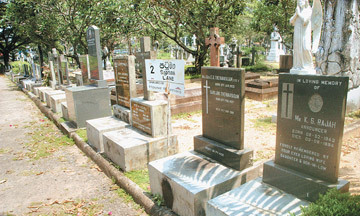 According to Chanaka, there are lot of disputes with regard to the ownership of these grave plots in the Borella cemetery as the ownership has not been properly transferred to the other family members before the original owners death. "When they come to use those disputed grave plots we obtain the consent of the other family members. But there are instances where some family members are abroad at the time of the funerals", he added. 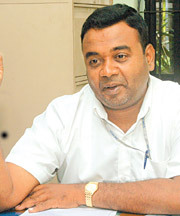 The Public Health Department of the Colombo Municipal Council keeps records of grave plot owners and the ownership can be transferred to another person after informing the Public Health Department of the CMC. "If there is any dispute regarding these grave plots we refer those disputes to the Legal Department of the CMC for settlements and the parties claiming the ownership are sometimes encouraged to use the grave plot amicably, if the real owners cannot be traced", he added. But the ownership of these grave plots sometimes does not arise as the number of burials is on the decrease. Many people are encouraged for cremations rather than going for burials. According to the cemetery keeper, about 12 to 15 burials and cremations take place the Borella cemetery making it the most busiest cemetery in the country. At present, there are four crematoriums in the Borella cemetery. But only two are functioning and the other two are being repaired. The cremations at these crematoriums are being done charging Rs. 1,500 from the residents of Colombo and Rs. 5,000 from outsiders. "CMC is offering the cheapest crematorium charges at present and there is big demand for the crematorium from outsiders", he added. To meet this demand and also enable to facilitate cremations in the morning hours, the CMC is planning to set up a new crematorium in the middle of the cemetery but it has not been materialised yet, due to various reasons. The crematorium cannot perform cremations till 2 pm as it is located closer to a school, hospital and residential area. For the burials, the aggrieved families should pay Rs. 1,000 to the cemetery keeper if he or she is a resident of Colombo. For outsiders, the fee is Rs. 5,000. The original Cemeteries and Burial Ordinance of 1899, which stipulates laws regarding the cemeteries and burials, Rs. 3 should be paid for digging a full size grave. The charge for the digging a grave for child under 10 years is Rs. 2 and for a child under 5 years is Rs. 1.50. The charge for digging a grave in a purchased plot was Rs. 5. The fee for allowing a cremation was Rs. 5 and for a cremation with the use of the Municipal pyre was Rs. 7.50 according to the clause 23 of the Cemeteries and Burials Ordinance of 1899 and stated in the Municipal bylaws. Whether it is a cremation or a burial the CMC is allowing only 2'X2' land plot for tomb in memory of a person. Though the original land allocated for the cemetery has been reduced from 100 acres to 45 acres the cemetery can allocate tiny plots for another few years. But, Borella cemetery is not the only cemetery in the Colombo city. 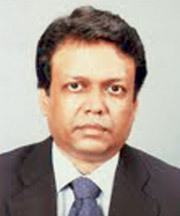 According to Dr. Pradeep Kariyawasam, the Chief Medical Officer of the Public Health Department under whose purview the cemeteries of Colombo city operates, the Madampitiya, Jawatta and Kirulapone cemeteries are used for cremations and burials. Although, the Jawatte or the Torrington cemetery, which has 12.5 acres land has not been utilised by the public due to various reasons, despite being located in a beautiful place. In the Jawatta cemetery also nearly 3,000 deeds have been given for grave plots. "We changed the entrance of the cemetery from Jawatta Road to Torrington avenue and changed its name as Torrington cemetery," Dr. Kariyawasam added. It also has a crematorium and facilities for firewood pyres. "A master plan is now being drawn up to improve the infrastructure of the Torrington cemetery and to lay curb stones, and tar of roads and byroads and improve parking areas and to have two crematoriums," Dr. Kariyawasam said. 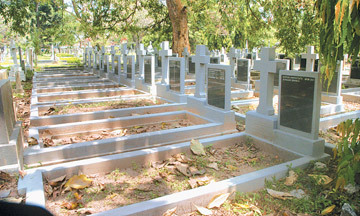 The Madampitiya cemetery which served the needs of the people in the Colombo North has a demand for burials and cremations. It also consists of a section for Roman Catholics, Church of England, the Christian, Buddhist and the Hindus. More than 5,000 graves have been purchased in the Buddhist and Hindu sections of the Madampitiya cemetery. "We are planning to have two more crematoriums in the Madampitiya cemetery to meet the demand for cremations", Dr. Kariyawasam added. The smallest cemetery in the Colombo city is located in Kirulapone and it was taken over by the Colombo Municipal Council from the Kotte Urban Council in 1965. It also has a crematorium for cremations. "Each of these cemeteries should have cemetery keeper. But at the moment we have only three cemetery keepers," Dr. Kariyawasam added. With regard to the construction of crematoriums for the four cemeteries, the CMC is facing problems since there is no qualified people to do the work. "We are seeking the assistance of the people outside the Colombo city to do the work on behalf of the CMC," Dr. Kariyawasam added. "Upto 1960's lands of these cemeteries were sold to people for future use. Now we cannot sell grave plots as we do not have lands. Half of the cemetery has been sold and now there is no space", Dr. Kariyawasam said. "Even now we sell four square feet land for the internment of ashes. Earlier we sold 15 square feet, " he added. Although you have to pay Rs. 18,500 for four square feet in Borella cemetery it can be purchased at a lower price. Explaining the current trend among people Dr. Kariyawasam said , "Lot of people go for cremations because of the land problems. Even the Christians who used to have burials are using the crematorium," he added. "It is good to cremate bodies rather than burring," he added. "We need more space. But in Madampitiya we can't see any alternative lands. But in Borella we have few acres undeveloped land . That area was used for wood pyre funerals and soon we will have to fill the land to make it suitable for burials," Dr. Kariyawasam added.